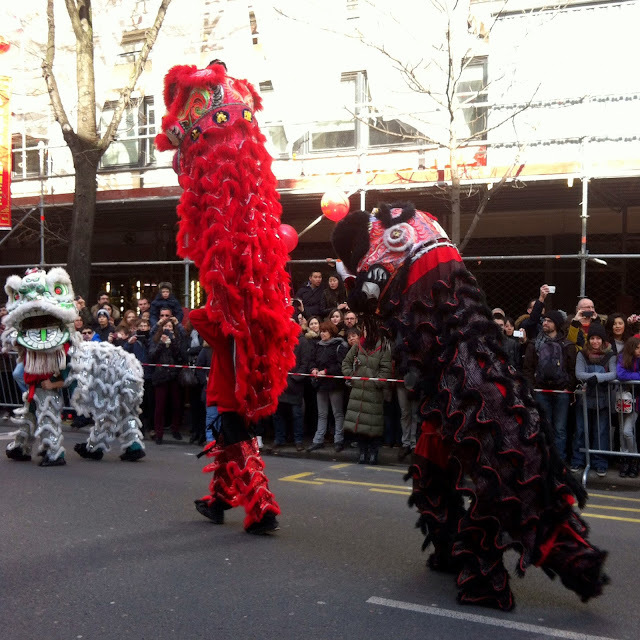 2015, the Year of the Goat/Sheep/Ram started off with an amazing display of Lunar New Year celebrations in Paris. 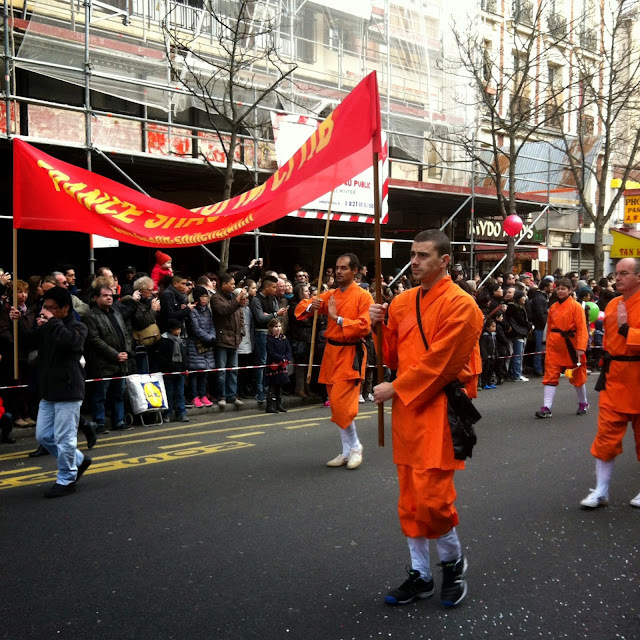 Incredibly impressed by the largest Lunar New Year Parade of France (and quite possibly Europe I might imagine), I was taken aback by the authenticity of the traditions displayed, as well as the French influence that brought on the warm and fuzzies I often feel in these multicultural situations. 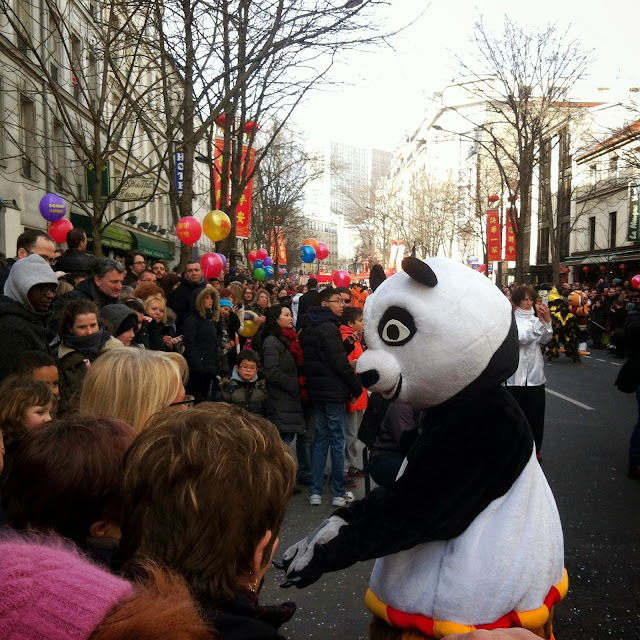 Last year we went to the parade in the 3rd arrondissement but didn't end up making it to the one in the 13th, this year it was noted in my diary. 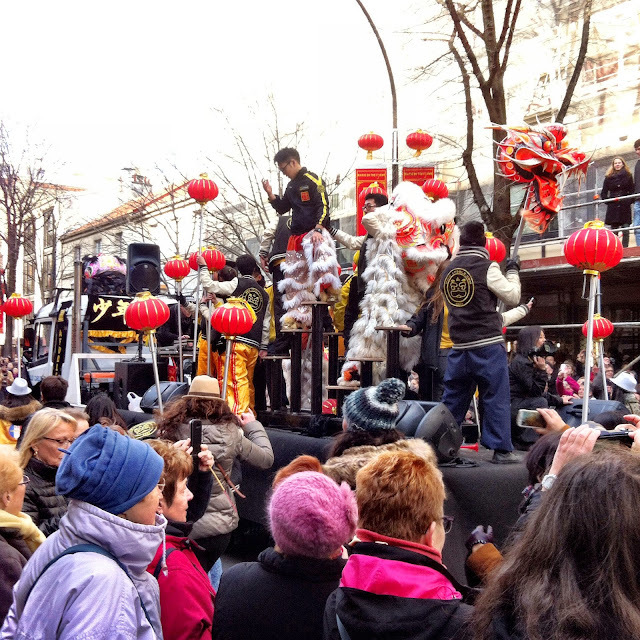 Lunar New Year celebrations in Paris are numerous, it's hard to keep track of all the parades in the 3rd, 4th, 10th, 11th, 19th and 20th arrondissements let alone the big events in the suburbs including the major Vietnamese Lunar New Year event in Massy. 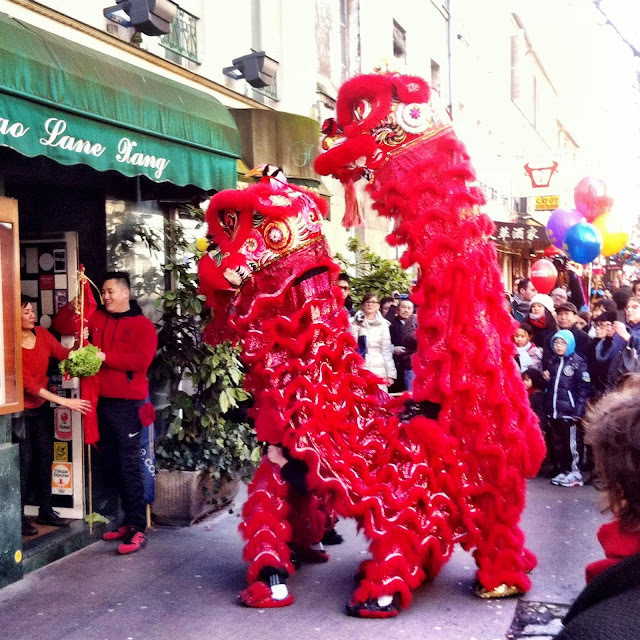 However, the biggest parade in Paris is that of the 13th, Paris's original "Chinatown". The 13th is home to loads of Asian grocery stores as well as restaurants ranging from Chinese to Vietnamese to Thai to Laotian to Cambodian, the list goes on. The food is probably the most authentic I have tasted in Europe and the prices reasonable too. A Vietnamese baguette with all the fillings can cost you around 2.60€ while a bowl of won ton noodle soup will set you back 6-7€. Bargain. 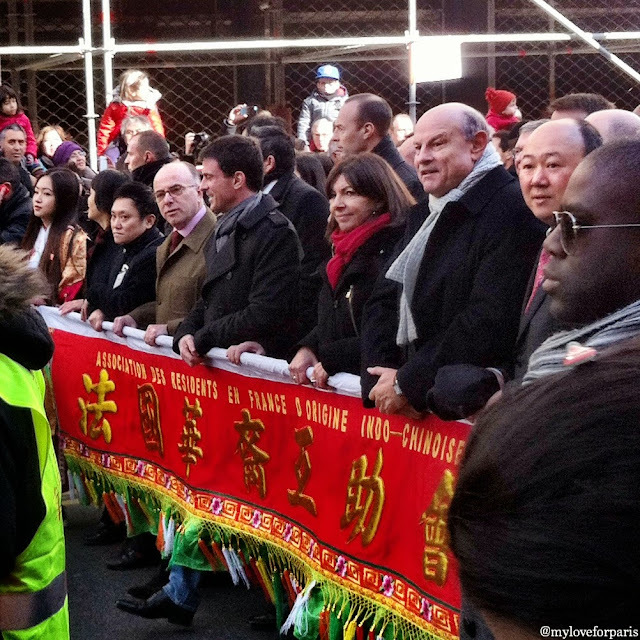 Not just present, but leading the actual parade was the Prime Minister of France, Manuel Valls along with the Minister of the Interior, Bernard Cazeneuve to his right and the Mayor of Paris, Anne Hidalgo to his left. 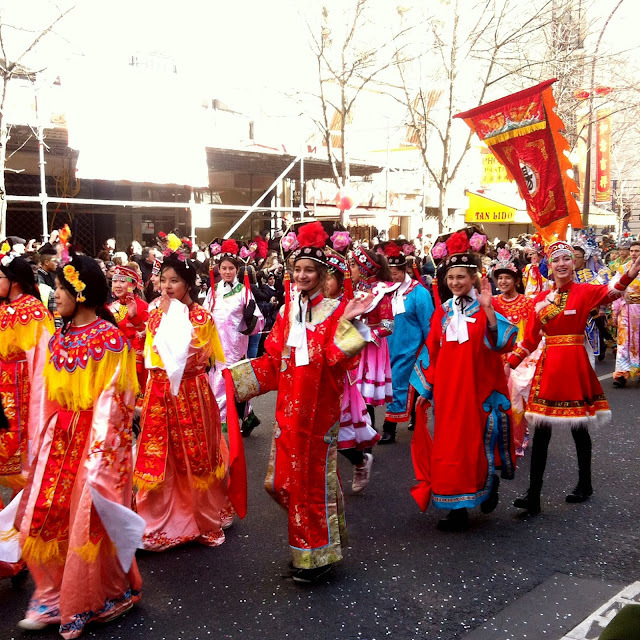 However, apart from that, it's also a time when you prepare to auspiciously usher in the New Year. You give your house/apartment a big spring clean, run all of your errands so that you have returned the things you've borrowed (especially money as you don't want to start the New Year owing money - except for that mortgage which is a little harder to sort out) and start the year afresh. I always spend the last day before the New Year frantically cleaning, cooking and making sure the sheets are fresh, the water filter changed, the supplies at home replenished and the chores done. Call me suspicious but I like to start the Lunar New Year with everything sorted. In my head it feels that the rest of the year will run just as smoothly! I also always start the first day of the New Year eating vegetarian (which in a traditional Asian diet equates to eating vegan as there is pretty much no dairy in Asian cuisine). I make sure I wear a touch of red (for good luck) and that I also try to wear a new piece of clothing. It's funny to think about all the effort I go to in France when I am away from home, the extra miles I go in order to observe traditions I never used to take notice of when I was in Australia close to my family. It is my third year in France this year and while I am feeling more and more French every day, the beautiful thing is that I have never felt more Australian, more Chinese and more Vietnamese - all at the same time. 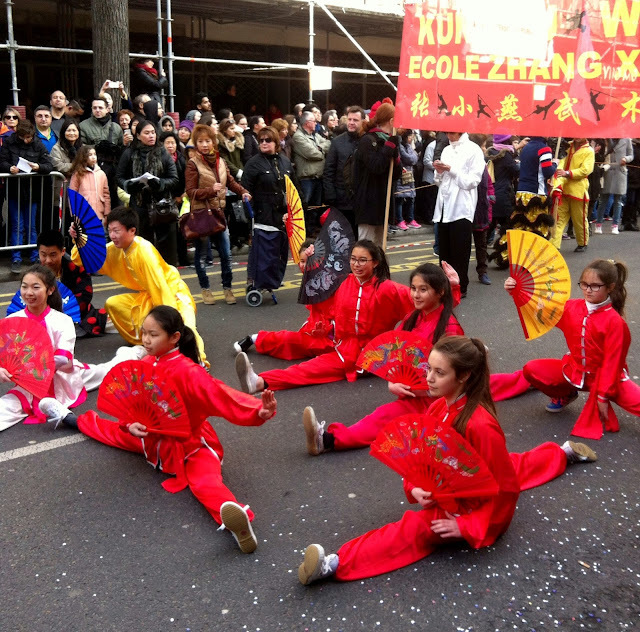 Back to the parade and its Dragon Dance displays..
Not to mention the incredible displays of flexibility and skill from one of Paris's many martial arts schools. 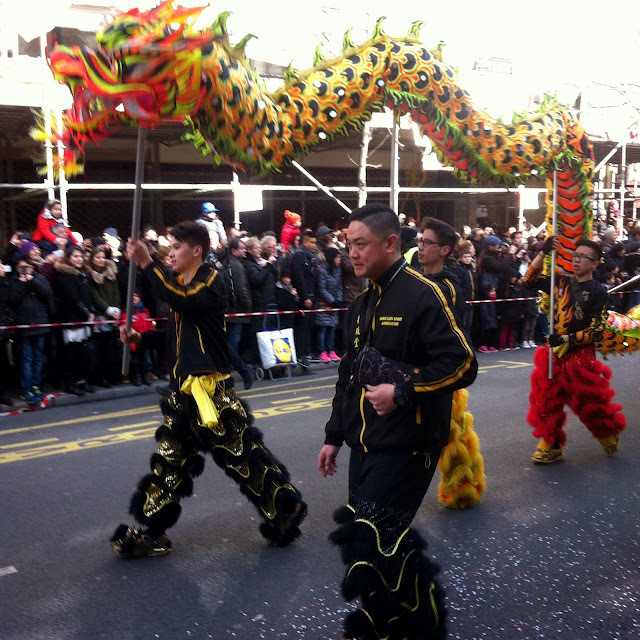 And more dragon dancing (dragons bring good luck as they are a magical creature able to scare off bad luck and any evil spirits lurking around). 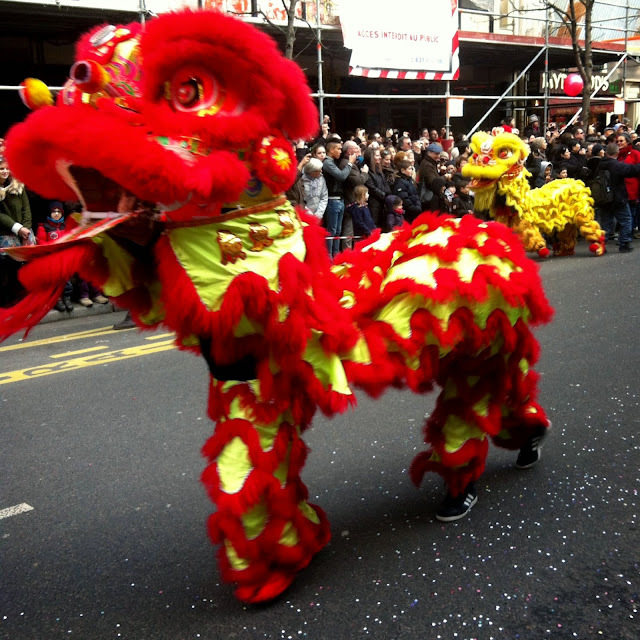 As well as some special guests from different eras of Ancient China. 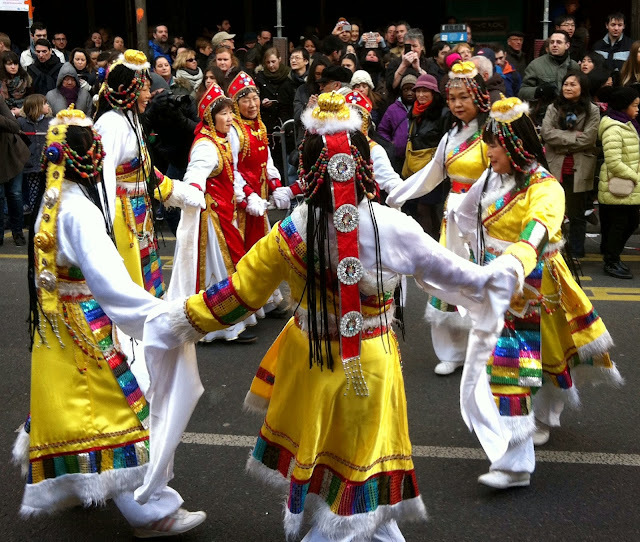 We also saw many different dance performances, from all different regions of Asia. This dance was to the famous "A Li Shan de Gu Niang" song (Girl of the 'A Li' Mountains), a song which I hadn't heard since I was a young girl! 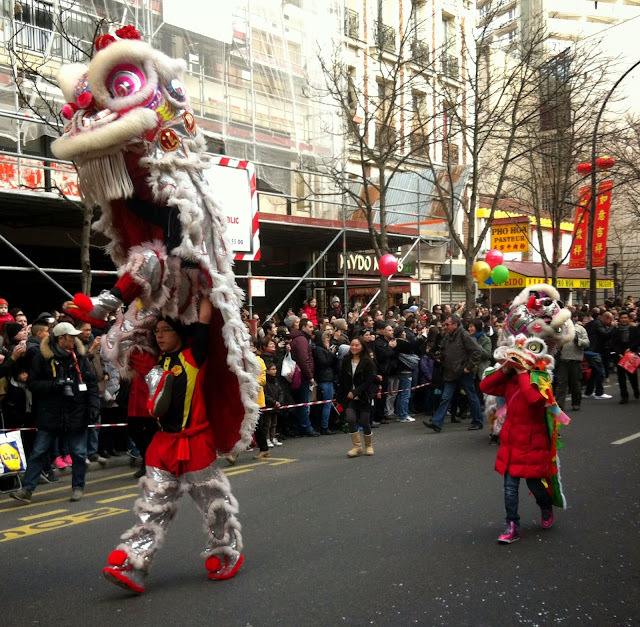 This little girl with her mini lion dance costume walking next to the two talented lion dancers ahead was such an adorable sight. 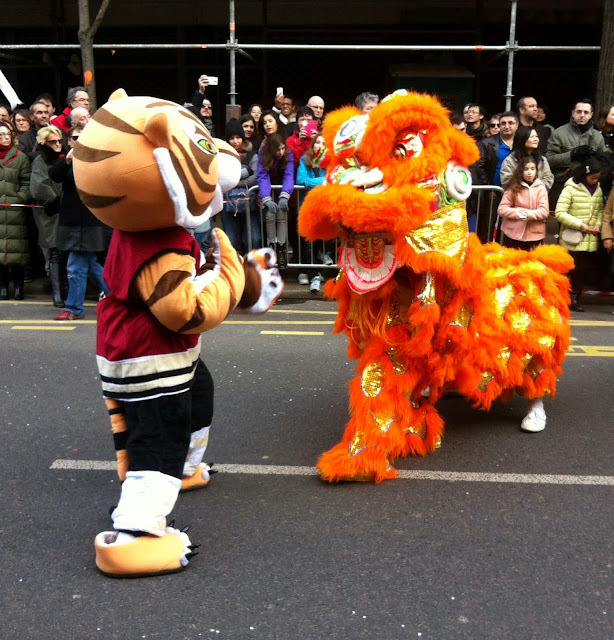 Lion dancing is such a demanding sport for both the lion's 'front' as well as its 'back'. The person on the ground needs to support the weight of the person on top when they are lifted and often the person standing on the ground will let their hands go leaving the person standing on top balancing momentarily on their own. Enough to bring on a mini heart attack as I hoped that no one would fall! As you can see, I have a 'cute' theme going. These little scholars bravely walked in the cold without their coats (while I was freezing with the 6 layers underneath my coat, including 2 layers of thermal!). I love how they are also wearing Ugg boots, sneakers and soccer shoes underneath - trop mignon! 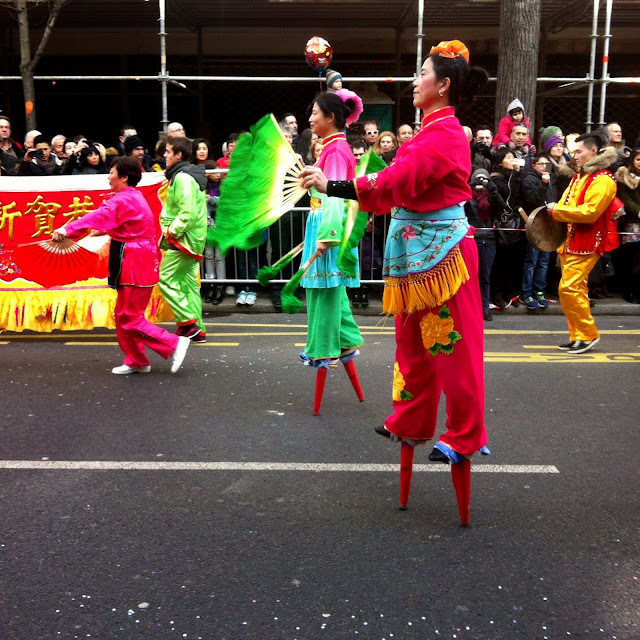 And as if it wasn't enough for me to be worrying about the lion dancers being lifted into the air and falling, these women came out on their stilts. 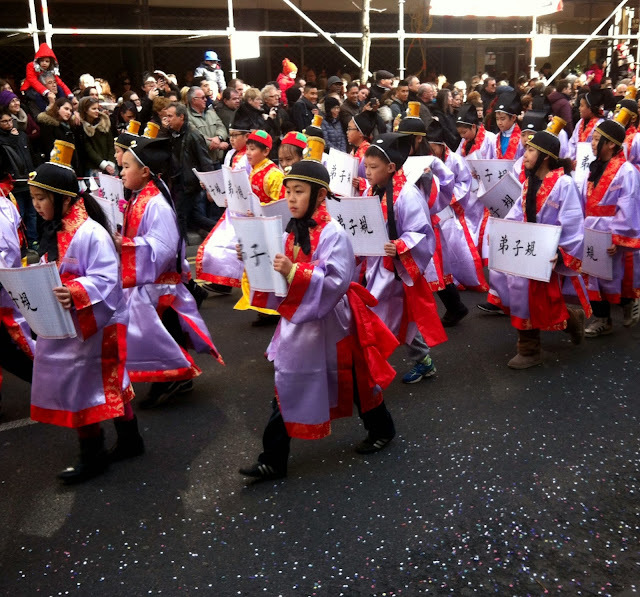 Please don't fall, it's Lunar New Year and nothing bad must happen during this time! Kung Fu Panda made an appearance and for the first time I realised he had... teeth..? 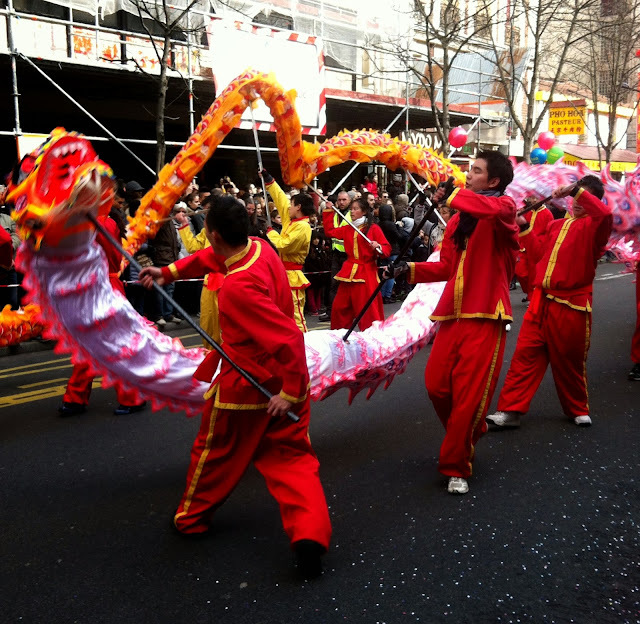 Then the last float came out - the largest, loudest truck with a Dragon Dance to a DJ set of, modern Billboard Chart type French music. It was fantastic sight seeing the crowd bopping along to ... French rap..! Crowds moved in closing the space between the parade and the people. All the roads that had been closed off were now filled with people walking around. 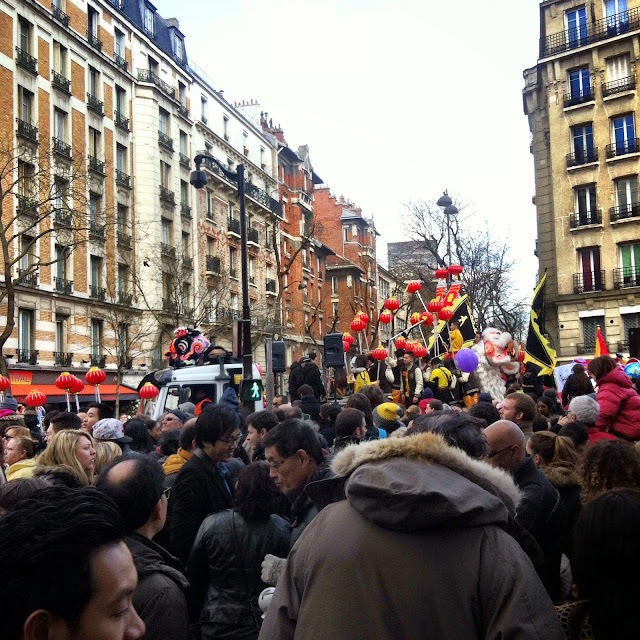 That buzz of disorder and 'n'importe quoi' that you often feel in Asia had temporarily transplanted itself into the streets of Paris and what felt like a massive Lunar New Year street party in broad daylight had taken over the 13th arrondissement.